Let me start by saying i love this forum. Everyone here has been so helpful, and the knowledge of the owners here is truly amazing. I've been reading about ideal swingarm angles. Anyone have thoughts on an ideal swingarm angle for the Superhawk? I have a Johnson angle measurement tool, and mine is currently at 10 degrees (bike without rider). I'll be working on measuring my rake and trail soon, and aligning the wheels to ensure everything is straight... I haven't done that yet on this bike, and am looking forward to getting a baseline. My goal is to do a few simple "mods" to the stock suspension that are super cheap, but net some gains in performance. I'm not really the kind of guy who throws a lot of money at brand names and "recipes". Not that anything is wrong with that, I just like to gather knowledge and do the work myself. I definitely have more time available than money. I've done valve stacks before, including redesigning shim stacks for my riding, done spring replacements, seals, oil, spacers... None of this stuff scares me, and i'll have time over the winter. I'm really looking forward to gathering more information to help others, such as recommended oil weights, spacer lengths, air gaps, etc... Anything i can do to help others on a budget. I sort of started down this path after I bought my VTR this year, as I felt guilty spending money on it as I already own a VFR800 and have done quite a bit to the suspension on that. Wasn't sure how accepting my wife was about having TWO bikes! The cheapest thing to do would be to add a shim between the top clevis and frame at the top of the shock. I have a 6mm shim that I bought on e-bay, but honestly with a bit of aluminium of the right thickness, a hacksaw, file and drill, you could make one. That will lift the back end up and steepen the rake, giving more responsive steering. I bought some 0.85kg/mm front springs from RaceTech, but you could use the VFR springs as you mentioned as these should be 0.74 vs the 0.585 kg/mm stock. Not perfect but probably better (stiffer) than stock. After that - shims/valves for the fork dampers. I bought ($5 ea) some compression valve bodies from a Suzuki from a local suspension tuner. These have much bigger ports than the VTR so flow oil better, more like a Gold Valve, and I have shimmed them up the same as Gold Valves. As far as I know you can mix and match Showa cartridge parts so long as you stick with 10mm shaft/20mm id size. I have re-shimmed the stock rebound pistons with 3, 0.15 x 17mm main shims to get a bit more control. I run 5W Motul oil at 120mm from the fork top, compressed with no springs. I'm pretty happy with how all this works. It is worth reading up on suspension set-up and I have done a bit of reading of the Race Tech Suspension Bible. Stiffer damping and springing is not always better, IMO the VTR has plenty of spring at the back, and enough damping adjustment. I ran mine with the preload at it's lightest setting and rebound set 2 turns out. No suspension modification will be worthwhile if the basic components are worn out, so you should look at replacing the fork bushings if these have wear, and also checking the steering head bearings for play/notching. The rear shock linkages could stand some love too. My favourite (but not suspension-related) upgrade was fitting CBR954 brakes; Honda got these right, I think they mismatched the calliper/master cylinder sizes on the VTR. I have since succumbed to temptation and added an Ohlins shock (trust me they are worth it for the plush control), and have just ordered a rebound Gold Valve set. I'm going to mirror my VFR fork set-up as that is still a ways better than the VTR as it stands. Don't tell my wife! Last edited by Cadbury64; 10-04-2015 at 07:17 PM. I'll run some numbers on those VFR springs, thanks for those numbers. I already have a 6mm shim between the frame and top of the rear shock, and rear shock is at its lightest preload setting. Front forks are showing 6mm above the clip-ons, with unknown oil weight (until now i haven't messed with them, as they don't leak, and i was focusing on other things). Current swingarm angle is 10 degrees and i just tried bunping rear preload by two notches and found the angle didn't change (not on the instrument i was using anyway). I may add more ride height to the rear just in the name of looking for a 12.5 degree swingarm angle... More on that later. 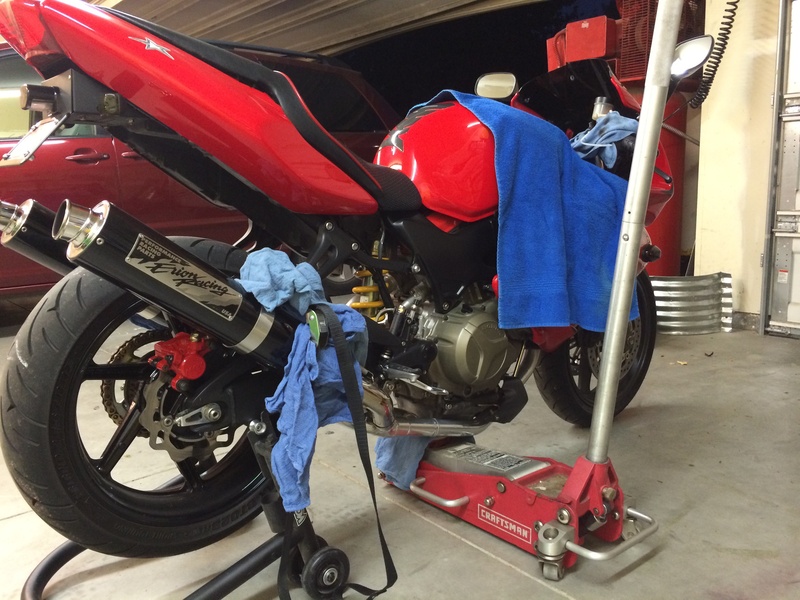 If you increase the spring preload at the shock, the ride height/swingarm angle should increase as the shock will sit higher in its stroke for any given load. If you were measuring this with the bike unladen on a stand you won't measure any change because the shock is already topped out. If the preload is already appropriate for your weight, then you could look to adding more shim height to lengthen the shock, but that may start to get the lower chain run a bit close to the exhaust. One other thing that may be affecting cornering feel is the tyre profile. Are they a bit worn, pressures OK etc? If it was me, I'd be flushing and refilling the forks with some fresh oil before going too much further. No need to dismantle the seals to do this. Last edited by Cadbury64; 10-04-2015 at 08:36 PM. Tires are near new Bridgestones and feel awesome. Love the tires in fact (023 rear/016 frt) with 42 rear/36 frt pressures. I too was worried about the chain vs exhaust equation. May try a couple shims tomorrow if i have time. Will let ya know how that changes things. Your bike is running wide due to a lack (or rather to much) of damping control of the fork and lack of spring. Google "Rogering" your forks and do it. Its a free mod. Then buy the correct spring weight for your weight. This is a must. Dont worry about swingarm angle. Its a non-issue. I have a good setup and 3mm spacer. This weekend I will be riding it all day at the track, no angle change. Bike turns perfectly. I only run a Ohlins for comfort. Today I ordered 1996 YamahaYZF600R fork springs (.77) for $15 shipped on Ebay! So, this fork spring install of .77 will balance the front and rear to exactly 93% of what Race Tech recommends. No it's not exactly what they recommend, but it is far more balanced than what I have now, for very little money. Last edited by thedeatons; 10-05-2015 at 02:26 PM. Got a surprise today! My 95 Yamaha YZF600R fork springs came in!!! 2) Thicker coils, definitely a heavier duty coil spring. 3) Longer so a smaller preload spacer will be used. I'll be working on making up the preload spacer out of 1" PVC, then doing the taper grind on the rebound rod, setting the fork oil level, then buttoning it all up. Called it quits for the night... Used Roger's method. Took the length of the old spring, and old spacer (410mm), subtracted the new spring length, and ended up with 32mm, the length of the new spacer. Set the oil level to 140mm from the top, once again according to Roger. All this done with the forks on the bike. I lowered the jack enough until the forks were at the bottom to set the oil level, then installed the new springs and spacers. Gonna taper grind the rebound rod tomorrow and set the sag front and rear. 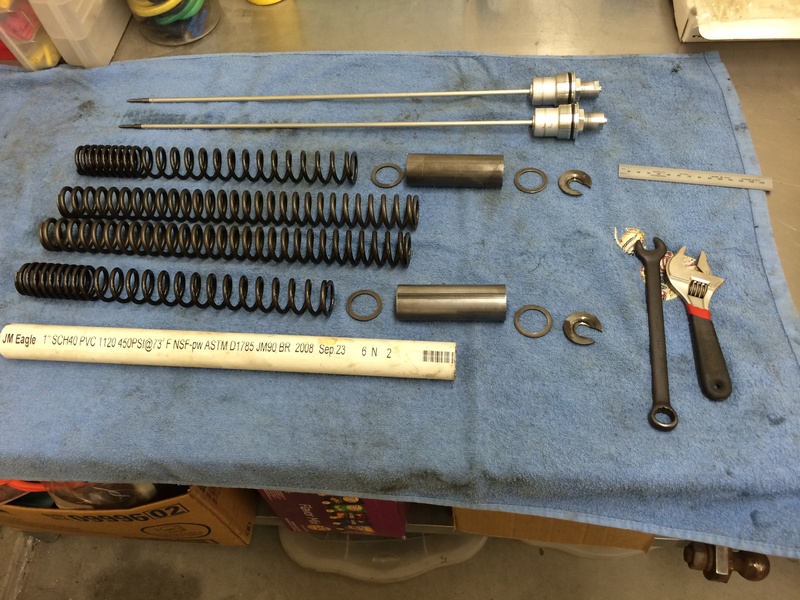 Tonight I got the new springs installed and did the taper grind on the rebound rod (I left the forks on the bike so I could get this done quick, but will completely disassemble the forks this winter and install new fluids, pistons, and shim stacks. I used a 32mm spacer above the fork springs to equal 410mm total length. With the rebound adjusters all the way out I get 29mm of sag (bike only, without me on it),using Roger's method (measure extended forks, pull forks up, let go and measure,then push forks down, let go and measure, average those two, subtract from extended fork measurement). So 29mm of free sag in the front. I checked the rear end also (stock rear shock and spring), and got 7mm of free sag in the rear. 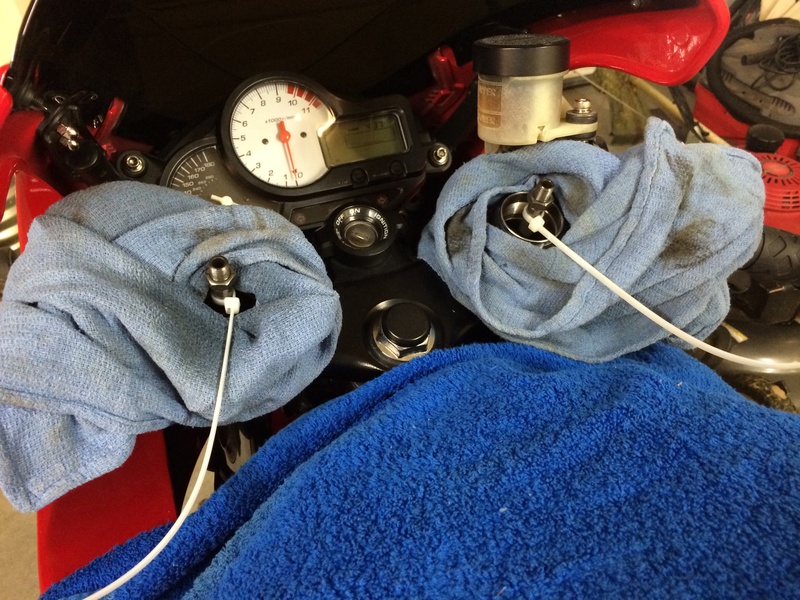 After sitting on the bike in full gear and measuring again, I got 14mm of static sag in the rear. 1) Wind the pre-load adjuster fully out. 4) Screw the Rebound adjuster IN. If it will not turn in wind the lock screw and the cap UP the damper rod and try again until the Rebound screw touches after 1 turn in. 5) If the Rebound screw does not connect after 2 turns in, wind the lock screw DOWN the damper rod and try again until the Rebound screw touches after 1 turn in. Stock setup was mushy (under rated fork springs) and harsh (too much high speed compression). Now the front end feels firm. 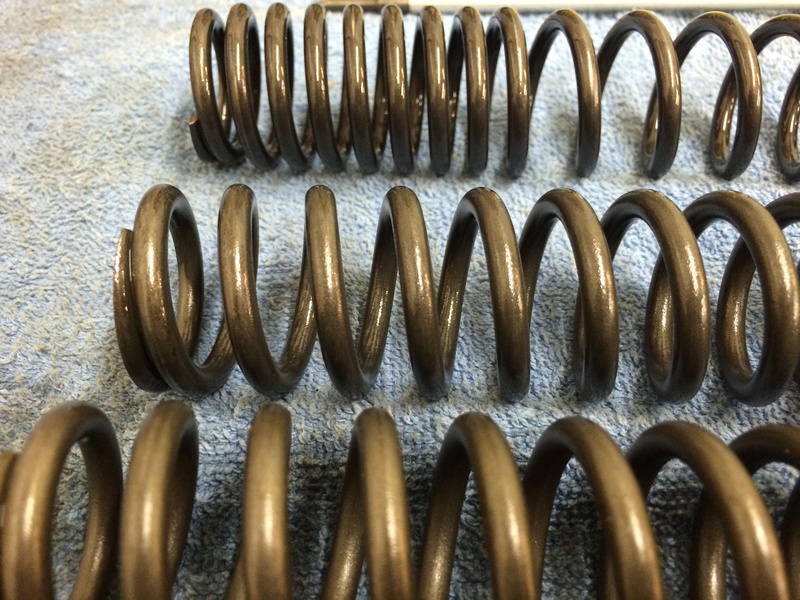 Can definitely tell there is a higher rated spring in there. I also notice less harshness over bumps. I think the stiffer spring rate is not allowing the fork to blow through its travel and only rely on the shim stack. Also could have something to do with the modified rebound rod... This is an unexpected, welcome blessing! Will hit some curvy roads in about an hour and report back. Just got home and i have to say this is probably the best $15 i've spent. The bikes now tracks well, doesn't dive on the brakes, allows mid-corner line changes even when leaned over pretty far, and is more comfortable/less fatiguing because the front end is riding higher now. it will feel better but still not be right. In these HMAS carts you do get some crossover between comp and rebound but a needle mod wont change that. It's easy to get in the ballpark, to get to the 95% good level. It's getting the last 5% out of it that takes the most time, and knowledge. Hey James, great to hear of your success! And cheap! Well done. Thank you!!! I'll continue to update this thread over the winter when i get into valving. What are you going to do for a shock? Nothing at this point. I want a Penske but cannot afford it right now. The stock rear spring is so close for my weight I'm not gonna bother with changing it, so I'll just wait until I have some money for an upgrade. Last edited by ren; 12-08-2015 at 12:48 PM. 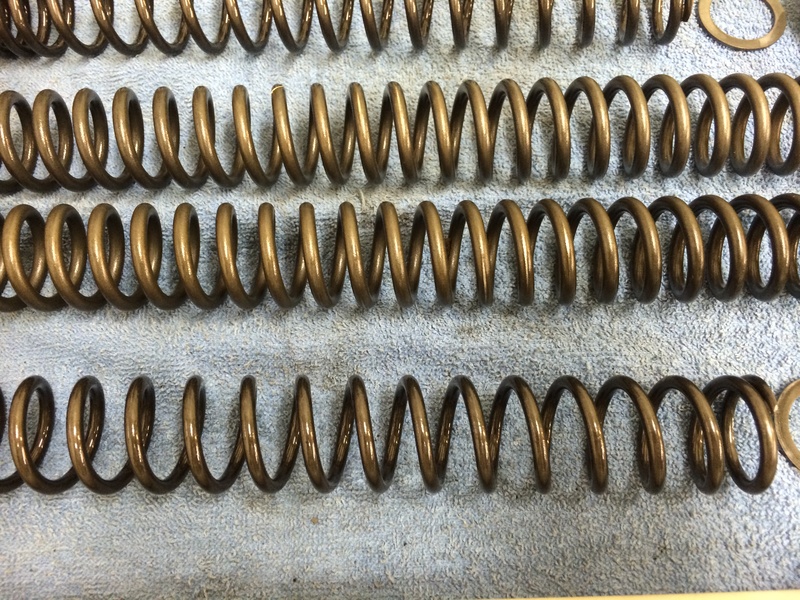 Yah, you have all winter to look for used springs from another bike that will work for your weight. Use the chart above to pick some out. $15 shipped was an amazing deal for the improvements I have so far, and I haven't even done the bleed hole or new fluid yet!!! $240 for better braking, better handling, and better looks. It's so nice to ditch the stock forks. What year gsxr forks did you go with?